People usually want to look their best no matter what time of the year it is. But for senior individuals and those with physical challenges, keeping up with fashion and maintaining good grooming routines might seem like more of a trouble for them, especially with their limited mobility and other health issues. But, fear not! If you’re the one providing long-term care for your loved ones, you can still assist them with their personal care in Georgia. In fact, we are sharing below the second part of our hair care tips to help you with your loved ones’ grooming routines. Just check out our previous blog article if you want the whole list of hair care tips. Determine how often your older or physically handicapped family members need to wash their hair even while receiving home care services in Savannah Georgia. Older adults usually don’t have to wash their crowning glory as often as their younger peers. Because seniors tend to perspire less and have drier hair, most of them may need to clean and style their hair only once per week. But if your loved ones have short hair and aren’t capable of bathing on their own, you may have to clean their hair using a washcloth while they sit down in order to avoid accidents that would lead them to require skilled nursing services. Look for alternatives for those times when you cannot assist your loved ones with their hair care tasks. If you’re unable to help them with their hair care tasks, search for alternatives. 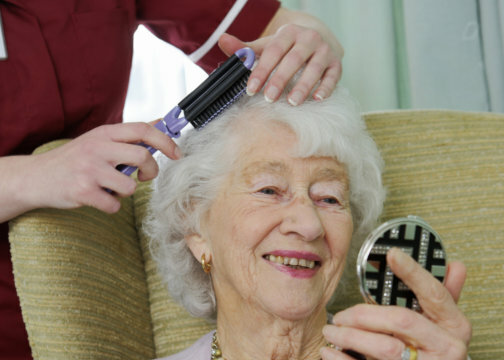 Friends, family members, or even our home care providers at Magnolia Home Care Service can come to their home and help them with daily living tasks such as hair care. Don’t hesitate to give us a call at 912-319-7273. This entry was posted in Hair Care and tagged good grooming routines, hair care tips, home care providers, long-term care, physical challenges. Bookmark the permalink.